Today’s performance will be live streamed on our website and available on Facebook live. Visit trinitywallstreet.org or the live Facebook event at 3pm ET to watch. With pianist Harold Mabern, bassist Gerald Cannon, drummer Joe Farnsworth, and tenor saxophonist Abraham Burton. More Smart Stuff coming soon. Enjoy the Holiday Shops, The Lodge by Urbanspace, and The Rink, the centerpiece of Winter Village and New York City’s only free admission ice skating rink. The Holiday Shops are open through January 2, 2019. Dinosaur Bar-B-Que / 700 W125th St. @ 12th ave. Walk only five minutes from the 125th St. station on the #1 line to find this authentic honky-tonk barbecue joint. Some folks think Dinosaur is just a place to eat ribs. Au contraire. 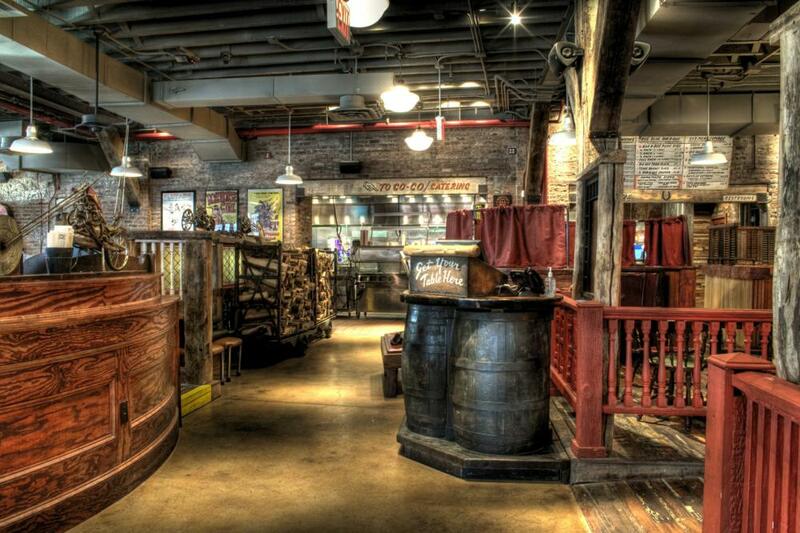 With 24 carefully selected taps, this is a place to drink beer, and eat ribs. No food goes better with American craft ales than American barbecue. Dinosaur may be the best combo of good beer drinking and hearty eating in town, which makes the trip uptown to West Harlem totally worthwhile. This second incarnation of Dinosaur in Harlem is in a two story, old brick warehouse near the Hudson River. Don’t let that run down exterior fool you. Inside it’s a large space with huge, rough wooden columns and unfinished wooden floors and brick walls – just right for a bbq joint. As soon as you open the front door you are hit with that tantalizing aroma of barbecue coming from the large open kitchen. Reminds me of those great rib joints I frequented when stationed in North Carolina all those years ago. If your stomach wasn’t grumbling before, it is now. Head to the bar, sit down and try to decide on a beer. It’s not an easy decision – a good problem to have. This is a pretty damn good beer list to choose from, one that most beer bars should be jealous of. I love that they feature NY craft beers. You may want to try the four beer sampler, which is always fun, and in this place may be necessary. The blues music playing in the background will get you in the mood for their North Carolina style barbecue, and even when it’s a full house your order shouldn’t take too long (assuming you snagged a table). The food is all slow smoked, so it’s already mostly done and ready to go. I always start with an order of their giant, spice rubbed wings, so good they may make you give up Buffalo wings. Unfortunately, a place this good does not fly under the radar. There can be some long waits for a table at dinnertime. So you need a strategy – avoid prime time, and try not to arrive with your entire posse, which will limit your seating options. A seat at the bar, a small table in the bar area, or in the summer, an outside table underneath what’s left of the elevated West Side Highway, all may open before a table inside the main dining room. Otherwise, try Dinosaur for lunch, or come very late for dinner, maybe after a show at the nearby Cotton Club nightclub. Subway: #1 to 125th St.
just past the elevated highway. This entry was posted in Uncategorized and tagged CHAMBER MUSIC SOCIETY OF LINCOLN CENTER, Handel's Messiah, Joe Farnsworth Quartet, Les Ballets Trockadero de Monte Carlo, new york events, new york events today, Noel Nights: Rufus & Martha Wainwright and Family and Friends, NYC Events, NYC Events Today, Sonnambula. Bookmark the permalink.